The C-HR and IZOA will be the first BEVs to be launched in China under the Toyota brand. The electrified C-HR for China. The interior of the IZOA. Toyota today premiered its C-HR and IZOA battery electric vehicles (BEVs) on the opening day of Auto Shanghai 2019. The C-HR and IZOA will be the first BEVs to be launched in China under the Toyota brand. Sales on the new models are slated to start from 2020. Toyota is also showcasing a variety of electrified vehicles like the hybrid electric vehicle (HEV) variants of the RAV4 and the Alphard/Vellfire in China, as well as the Corolla and Levin plug-in hybrid electric vehicle (PHEV) series launched in March 2019. 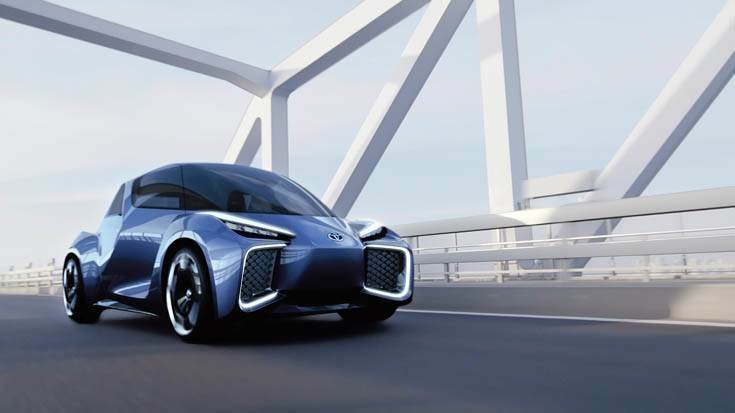 There is also the RHOMBUS (pictured below), a battery electric vehicle concept car developed by TMEC, Toyota's base for R&D in China. Commenting on fuel cell electric vehicles (FCEVs), Toyota executive vice-president Moritaka Yoshida said, "Since 2017, Toyota has been conducting demonstration tests with the Mirai in China. We are considering the local introduction of other fuel cell vehicles such as the FC Coaster." Beginning with the China debut of the electrified C-HR and IZOA vehicle models, Toyota plans to roll out more than 10 BEV models globally during the first half of the 2020s, and is moving steadily forward to popularise electrified vehicles, setting a sales target of more than 5.5 million electrified vehicles globally by 2030.